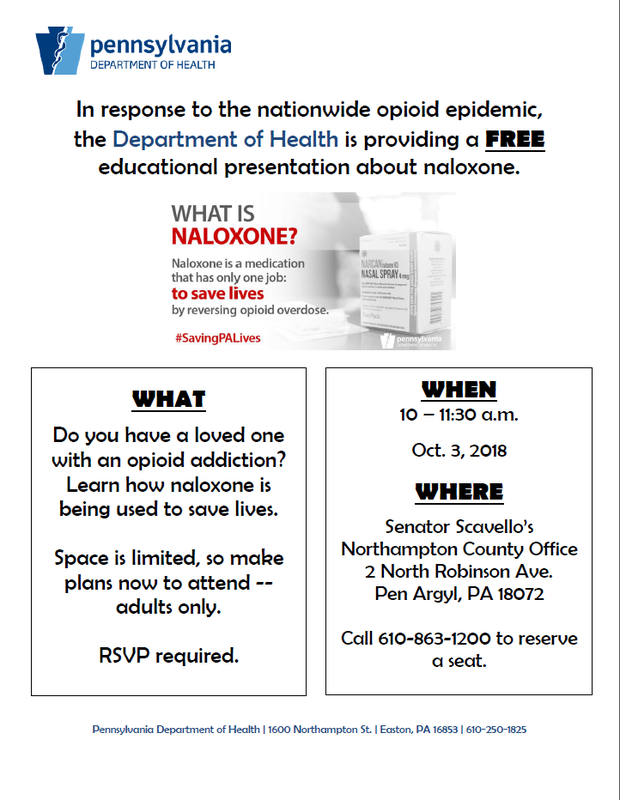 On Wednesday, I will be co-hosting a free educational presentation about the use of naloxone with the PA Department of Health from 10 a.m. to 11:30 a.m. Please call 610-863-1200 to RSVP a seat today. 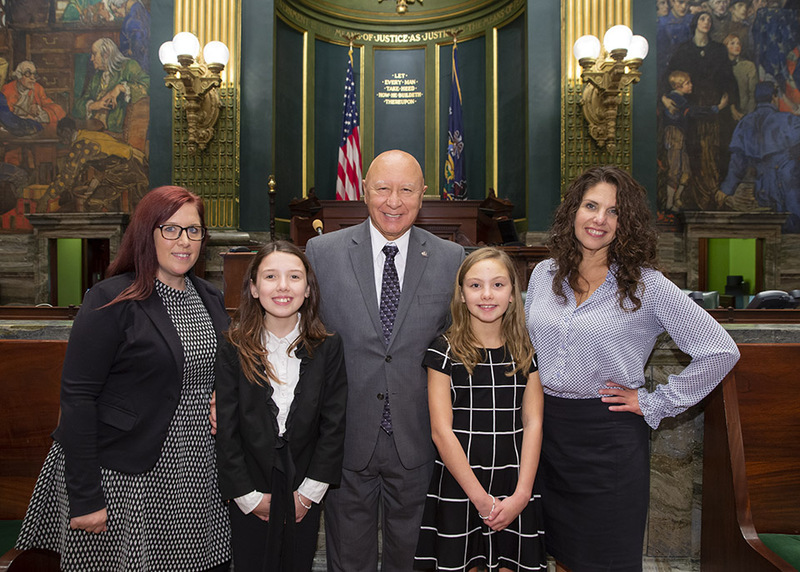 Legislation I sponsored to fund spinal cord disability research in Pennsylvania was approved Tuesday by the Senate and sent to the House of Representatives for consideration. Senate Bill 31 would create the Spinal Cord Disability Research Grant Program aimed at discovering new and innovative treatments and rehabilitative efforts for spinal cord disabilities. The legislation would invest $1 million into a grant program that awards grants to research institutions for research into spinal cord injuries. Pennsylvania would join a dozen other states, including New Jersey, Ohio, New York, Maryland and Virginia, supporting this effort. Many of these states now represent the cutting edge in spinal cord research and have made extensive breakthroughs in a short period of time, the senator noted. Pennsylvania is rich with talented research universities and an innovative medical field, which means we are well positioned to bring hope to citizens with spinal injuries. One million dollars can go a long way in providing breakthroughs in spinal cord research. It could someday be the difference that helps millions live a vital, full life. Senate Bill 1098, which I am co-sponsoring, would encourage the placement of cameras on school buses to capture motorists who pass when red signals are flashing. State law does currently allow such cameras, but amending the Vehicle Code for the purpose is expected to lead to wider use. The bills now go to the House of Representatives for consideration. Legislation I am co-sponsoring to create First-Time Homebuyers Savings Accounts in Pennsylvania was approved by the Senate Wednesday. Senate Bill 1066 would permit eligible Pennsylvanians to open special savings accounts and take state tax deductions for savings toward expenses such as a down payment and closing costs. This week we welcomed several students from the 40th Senate District to Harrisburg to serve as guest pages and learn about the State Capitol. 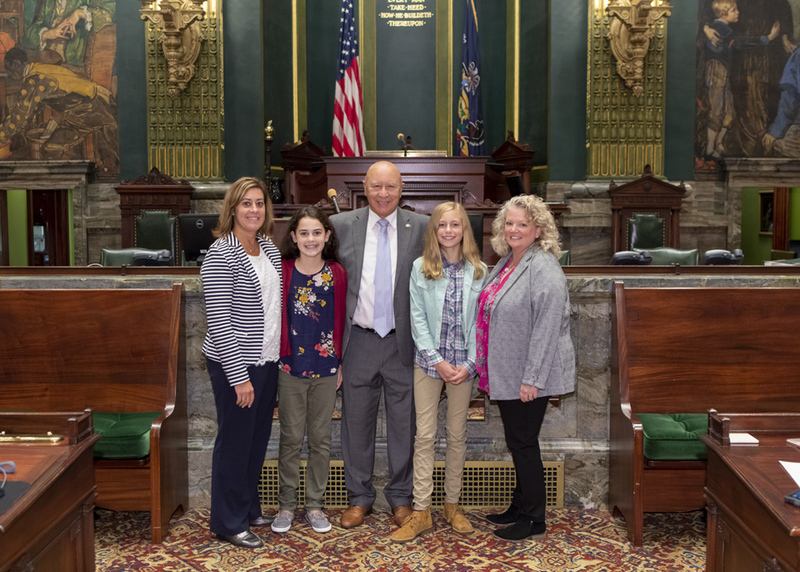 Sydney Wolbert is a fifth grader at JM Hill in East Stroudsburg, a stand-out student and member of the Pocono Family YMCA Swim Team. Jenna Kimler is in sixth grade at JT Lambert Intermediate School; loves her math and science classes; and is a member of the Builders Club and YMCA swim team. She also aspires to be a NICU doctor. Natalie Brazeau is a seventh grader at Pocono Mountain East who loves math and science. Her dream is to become a defense attorney and she has served as a member of the Student Government Association. She plays field hockey, paints, writes and loves the outdoors. Luca Furino is also a seventh grader at Pocono Mountain and has served in Student Government since 5th grade. She participates in a variety of community service and school activities and takes great pride in serving as a role model for her peers. She plays a variety of sports and is an honor roll student. These young ladies are exceptionally bright and driven students. It was a privilege to show them the legislative process, have them sit in on meetings and experience the different steps of how a bill becomes a law. 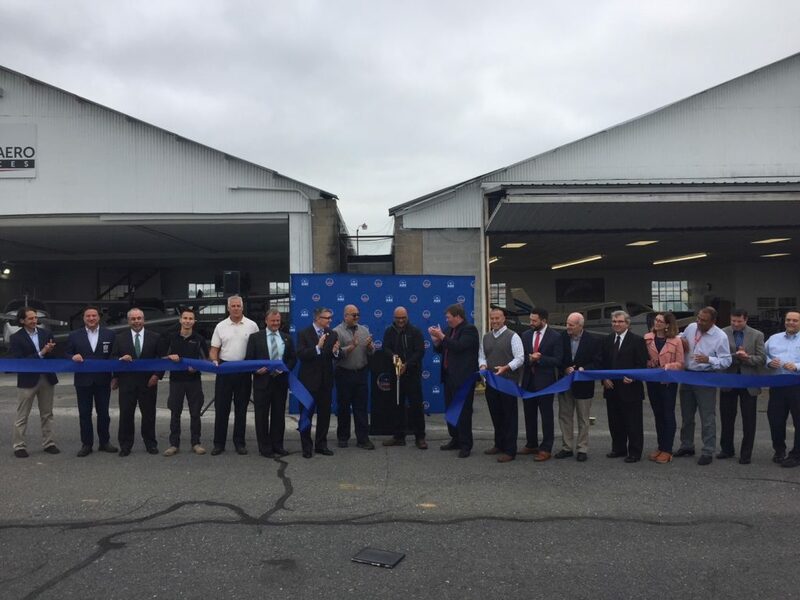 Braden Airpark in Forks Township recently celebrated the addition of two new businesses at the airport, ProFlite Aero Services and SpiritWings Aviation. The combination of these two businesses will add additional aviation services to the Airpark, including a flight school and maintenance operations. Thank you to both ProFlite and SpiritWings for helping create more economic opportunity for Braden and making this an even more attractive destination for aspiring and seasoned pilots alike. Pennsylvania ranks 11th in the nation for our number of aviation facilities. The Commonwealth has 127 public-use airports and 244 private-use airports, and their combined impact represents a 23.6 billion dollar economic impact to the state, supporting over 300,000 jobs. As a member of the Senate Aviation Caucus, I’m particularly excited by these new ventures and continuing to strengthen the future of Braden Airpark throughout the region.